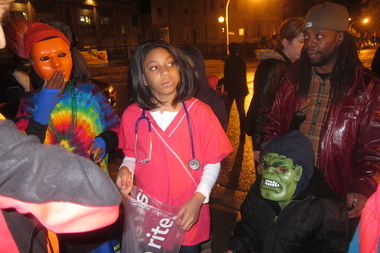 The annual trick-or-treating event runs from 6-8:30 p.m. at Buena Circle Park on Halloween. CHICAGO — While suburbs typically set Halloween trick-or-treat hours, Chicago has traditionally allowed parents to determine when their kids can go door to door. However, police have recommended that people "try to confine trick-or-treating to daylight hours." Wear light-colored costumes. It's important that children be prominently visible, so that they stand out to both cars and pedestrians. For dark costumes, police recommend the addition of reflective tape. It's also recommended to stay away from masks, which can "restrict your child's vision," police say. Make sure children are always supervised. If not by their parents, police said, they should be with "an adult or responsible young adult [parents] know well." Stick to homes and neighborhoods you know. Trick-or-treaters should never enter an unfamiliar home, and they should totally stay away from "any abandoned building, deserted area or enclosed space." Only accept wrapped candies. Police urge children and their families to throw away "any fresh fruit, unwrapped candies, open candies or any treat that looks suspicious." Cross streets, drive with care. On a night that sees groups of children crowding the streets, drivers and pedestrians alike should stay extra-vigilant to avoid accidents.